The New Horizons team is releasing their first set of five research papers on Pluto and its moons. What the team is calling a “comprehensive set of papers” is the result of the New Horizons spacecraft’s close encounter with Pluto and its moons last summer. New Horizons has been transmitting data from the encounter that time, and will be sending data back for months to come. We can tell from images that Pluto is not what we thought it was. Images and data show that Pluto is a much more active planet than we thought, and its surface shows a diversity of landscapes and geological processes. There’s been a lot of discussion about Pluto and its moons, and a lot of educated guesses about what’s going on there, but the 5 papers released by the team will take the discussion to a new level. “These five detailed papers completely transform our view of Pluto – revealing the former ‘astronomer’s planet’ to be a real world with diverse and active geology, exotic surface chemistry, a complex atmosphere, puzzling interaction with the sun and an intriguing system of small moons,” said Alan Stern, New Horizons principal investigator from the Southwest Research Institute (SwRI), Boulder, Colorado. The surface of Pluto is a constantly changing palette, shaped by the interactions between the volatile compounds nitrogen, methane, and carbon monoxide ices with the much sturdier and more predictable water ice. The evaporation and condensation of these compounds shapes the surface of Pluto. “These cycles are a lot richer than those on Earth, where there’s really only one material that condenses and evaporates – water,” said Will Grundy of the Lowell Observatory, Flagstaff, Arizona. Images from New Horizons showed that Pluto’s moons are highly reflective, much more reflective than other bodies in the Kuiper Belt. This led scientists to believe that rather than being captured from the Kuiper Belt and drawn into orbit around Pluto, the moons may have been a result of a collision that formed the Pluto system. The New Horizons team has found evidence to support this, and evidence that the surface ages of some moons are at least 4 billion years old. “These latter two results reinforce the hypothesis that the small moons formed in the aftermath of a collision that produced the Pluto-Charon binary system,” said Hal Weaver, New Horizons project scientist from the Johns Hopkins University Applied Physics Laboratory in Laurel, Maryland. There’s a lot of material in these papers, and I direct interested readers to a summary here: Top New Horizons Findings. The papers are published in Science. Over the course of the past decade, many amazing discoveries have been made at the edge of the Solar System. Thanks to the work of astronomers working out of Earth-based observatories, with the Hubble Space Telescope, and those behind the recent New Horizons mission, not only have new objects been discovered, but additional discoveries have been made about the ones we already knew about. For example, in 2005, two additional satellites were discovered in orbit of Pluto – Hydra and Nix. The discovery of these moons (which has since been followed by the discovery of two more) has taught astronomers much about the far-flung system of Pluto, and helped to advance our understanding of the Kuiper Belt. Nix was discovered in June of 2005 by the Hubble Space Telescope Pluto Companion Search Team, using discovery images that were taken on May 15th and 18th, 2005. The team was composed of Hal A. Weaver, Alan Stern, Max J. Mutchler, Andrew J. Steffl, Marc W. Buie, William J. Merline, John R. Spencer, Eliot F. Young, and Leslie A. Young. Nix and Hydra were also independently discovered by Max J. Mutchler on June 15th, 2005, and by Andrew J. Steffl on August 15th, 2005. At the time, Nix was given the provisional designation of S/2005 P 2 and casually referred to as “P2”. Once pre-recovery images from 2002 were confirmed, the discoveries were announced on October 31st, 2005. In accordance with IAU guidelines concerning the naming of satellites in the Solar System, the moon was named Nix. Derived from Greek mythology, Nix is the goddess of darkness and night, the mother of Charon and the ferryman of Hades (the Greek equivalent of Pluto) who brought the souls of the dead to the underworld. The name was officially announced on June 21st, 2006, in an IAU Circular, where the designation “Pluto II” is also given. The initials N and H (for Nix and Hydra) were also a deliberate reference to the New Horizons mission, which would be conducting a flyby of the Pluto system in less than ten years time after the announcement was made. Based on observations with the Hubble Space Telescope of Nix’s geometric albedo and shape, the satellite was estimated to measure 56.3 km (35 mi) along its longest axis and 25.7 km (16 mi) wide. However, images provided by the New Horizons’ Ralph instrument on July 14th, 2015, indicated that Nix measures 42 km (26 mi) in length and 36 km (22 mi) wide. Nix follows a circular orbit with very little eccentricity (0.0020) and a low inclination of approximately 0.13°. It is in the same orbital plane as Charon, is in a 3:2 orbital resonance with Hydra, and a 9:11 resonance with Styx. Its orbital period is roughly 24.9 days, meaning it takes about 25 days to complete a single orbit of Pluto. As with Hydra and perhaps the other small Plutonian moons, Nix rotates chaotically, which is due mainly to its oblong shape. This means that the moon’s axial tilt and day length vary greatly over short timescales, to the point that it regularly flips over. Early observations conducted by Marc W. Buie and William M. Grundy at the Lowell Observatory appeared to show that Nix has a reddish color like Pluto, but unlike any of its other moons. However, more-recent studies conducted by S. Alan Stern et al. using the Hubble Space Telescope’s Advanced Camera for Surveys (ACS), have indicated that it is likely as grey as the remaining satellites. From these observations, it is likely that the surface of Nix is composed primarily of water ice (like Hydra) and may or may also have trace amount of methane ice on its surface. If true, then the exposure of these deposits of methane ice to ultra-violet radiation from the Sun would result in the presence of tholins, which would give it a reddish hue. However, when the New Horizons space probe photographed Hydra and Nix during its flyby of the Pluto system, it spotted a large region with a distinctive red tint, probably a crater. The appearance of this surface region – a spot of red against an otherwise grey landscape – may explain these conflicting results. Thus far, only one mission has been performed to the Pluto system that resulted in close-up and detailed photographs of Nix. 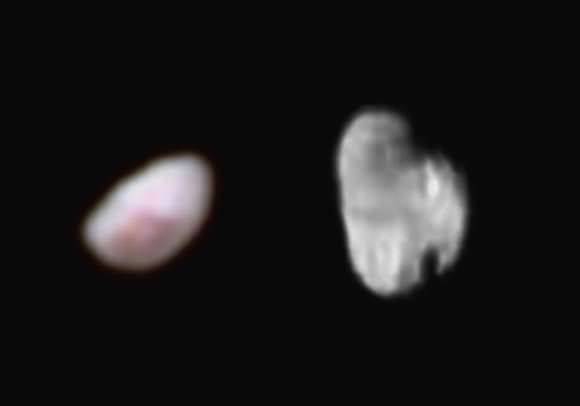 This would be the New Horizons mission, which flew through the Pluto-Charon system on July 14th, 2015 and photographed Hydra and Nix from an approximate distance of 640,000 km (400,000 mi). Until July 13th, 2015, when NASA’s Long Range Reconnaissance Imager (LORRI) on board New Horizons determined Nix’s dimensions, its size was unknown. More images and information will be downloaded from the spacecraft between now and late 2016. 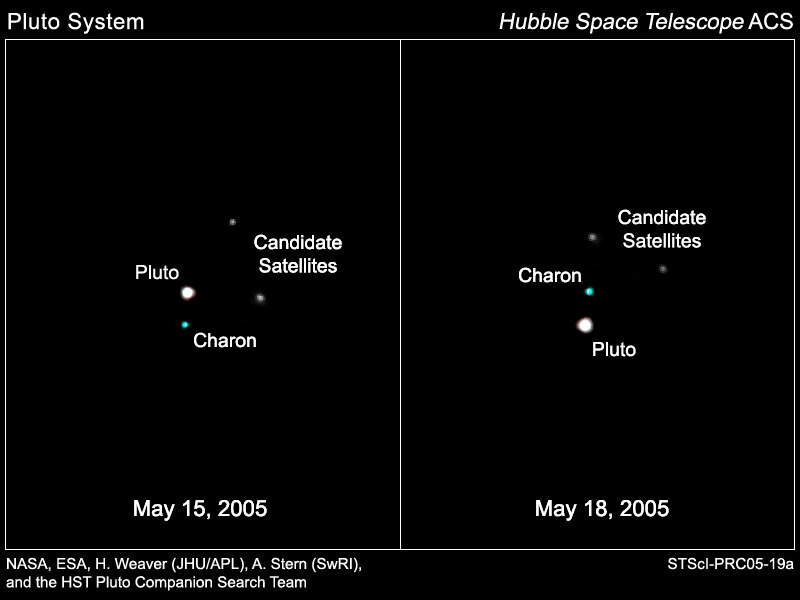 Prior to the discovery of Hydra and Nix in 2005, Pluto was believed to share its orbit with only the satellite of Charon – hence why astronomers often refer to it as the “Pluto-Charon system”. However, since the discovery of these two additional satellites in 2005, two more have been discovered – Kerberos in July of 2011 and Styx in July of 2012. This raises the number of bodes in the Pluto-Charon system to one primary and five satellites. And thanks to the recent New Horizons flyby, we got to see all of them up close for the first time! Like most large bodies in the Kuiper Belt (not to mention their satellites) much remains to be learned about Nix and its companions. In time, and with more missions to the outer Solar System, we are sure to address many of the mysteries surrounding this particular satellite, and will probably find many more waiting for us! 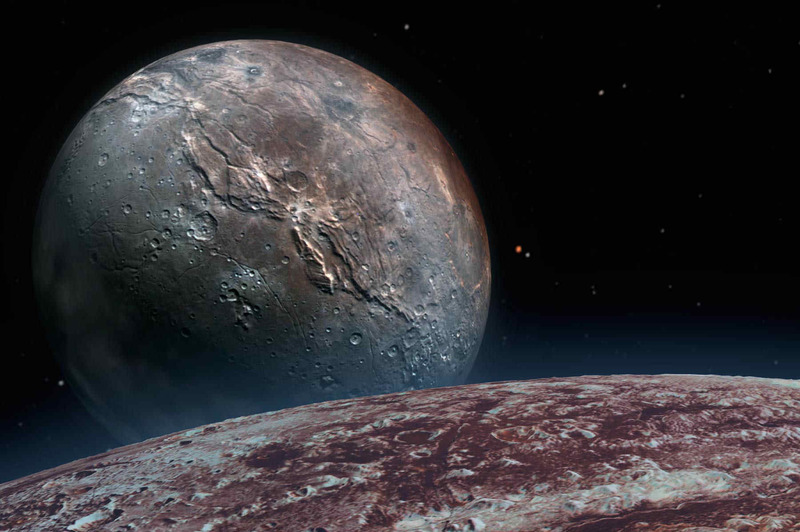 We have written many interesting articles on Pluto, its system of moons and the Kuiper Belt here at Universe Today. Here’s Moons of Pluto, Pluto’s New Moons are Named Nix and Hydra, and Pluto’s Moons Nix and Hydra Get Real. And here’s New Horizons Now Close Enough to See Pluto’s Smaller Moons, and Fifth Moon Found Around Pluto. Astronomy Cast has a wonderful episode on the New Horizons mission, titled On Pluto’s Doorstep – Live Hangout with New Horizons Team. For more information, check out NASA’s Solar System Exploration: Nix and PlanetEdu.com’s page on updated images of Nix and Pluto’s other moons..